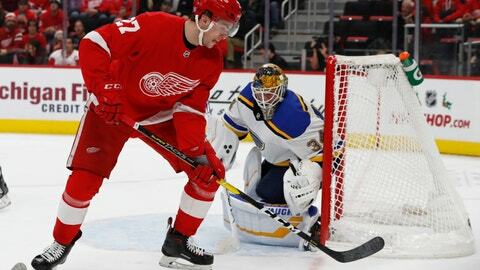 DETROIT (AP) — Tyler Bertuzzi doesn’t mind going into areas where there will be more physical play, like in front of the net, the corners and behind the net. That was a good thing for the Detroit Red Wings on Wednesday night. “I love him as a player. He competes,” Detroit coach Jeff Blashill said about Bertuzzi, the nephew of former NHL player Todd Bertuzzi, who also played for the Red Wings. Tyler Bertuzzi said he’s has not changed as a player. “They have a lot of speed and they really took it to us in the first half of the game,” Allen said. “We didn’t flip the switch until it was already 3-0. NOTES: Detroit defenseman Trevor Daley left the game in the first period with a lower-body injury. .. St. Louis LW Alexander Steen returned after missing six games with an upper-body injury. … Detroit D Jonathan Eriksson returned after missing 11 games with an undisclosed injury. … The Red Wings dressed 11 forwards and seven defensemen.